Snow folded by advancing lava . Credit: Eva Eibl (distributed via imaggeo.egu.eu). The photograph shows the interaction of the first snow and an active lava flow during the 2014 / 2015 Holuhraun eruption in Iceland. The first snow fell onto a ground covered by fine black ash on 26 September 2014. 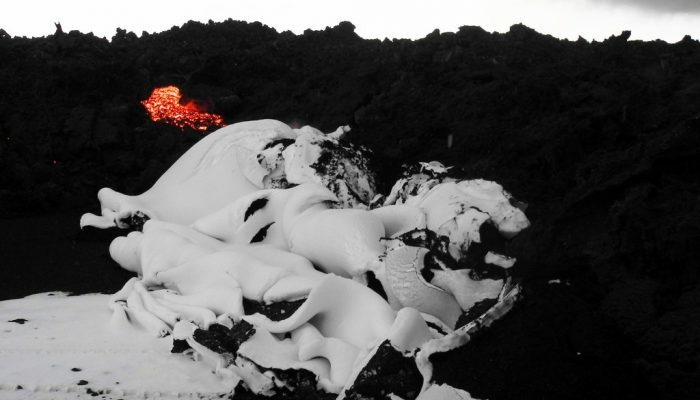 While the meter thick lava flow advanced a few meters per day, it neither melted the snow nor flowed on top of it. Instead, it pushed a layer of centimetre-thick snow and millimetre-thick ash out of the way, folding it like icing on a cake. The photograph was taken on September 27, when the lava flow field had covered an area of more than 44.2 km2. This is the size of nearly 6200 football fields or more than half of the total size of Manhattan (water and land area). By the end of the eruption the area covered by lava had almost doubled this and was the largest recorded in Iceland in 200 years. Prior to the eruption, increasing and migrating seismicity was detected from 16 August 2014 in the location of the Bárðarbunga volcano, beneath the Vatnajökull ice cap. Small sub-glacial eruptions were also inferred based on observations on the ice surface and research on long-lasting ground vibrations (called volcanic tremor). The eruption then started sub-aerially on 29 August 2014 and continued (with a small break on 30 August) until March 2015. A multidisciplinary approach   was used to study the growing lava flow. This included the use of GPS instruments, satellites and seismic ground vibrations recorded by an array of seismometers. The research was conducted through a collaboration between University College Dublin & Dublin Institute for Advanced Studies in Ireland, the Icelandic Meteorological Office & University of Iceland in Iceland and the GeoForschungsZentrum in Germany. The FP7-funded FutureVolc project financed the above mentioned research and further research on early-warning of eruptions and other natural hazards such as sub-glacial floods. If you pre-register for the 2018 General Assembly (Vienna, 08–13 April), you can take part in our annual photo competition! From 15 January until 15 February, every participant pre-registered for the General Assembly can submit up three original photos and one moving image related to the Earth, planetary, and space sciences in competition for free registration to next year’s General Assembly! These can include fantastic field photos, a stunning shot of your favourite thin section, what you’ve captured out on holiday or under the electron microscope – if it’s geoscientific, it fits the bill. Find out more about how to take part at http://imaggeo.egu.eu/photo-contest/information/.